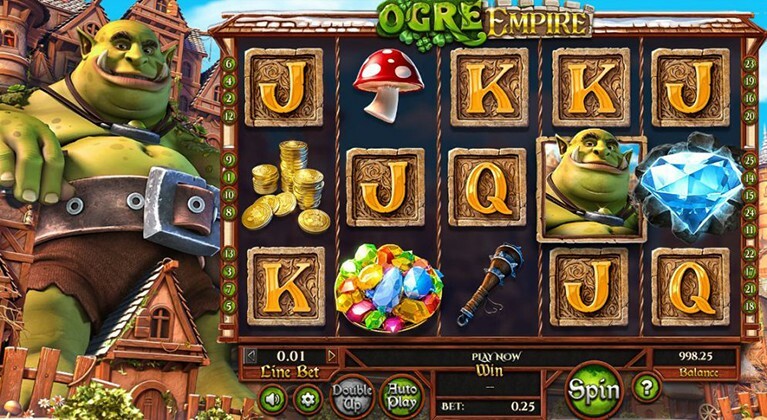 Ogre Empire is a Betsoft Gaming powered 3D video slot, with 5 reels and 25 paylines. Inspiration for this video slot came from the tale as old as time, fantasy kingdom haunted by a big, green Ogre. Ogre Empire slot comes with two different game modes, Day and Night modes. Design of the slot is very high quality with 3D Ogre looking around reels and town. Low paying symbols are standart playing cards A’s – J’s. High paying symbol are the Ogre, the Diamond, Plate of Jewels, Gold Coins, Ogre’s Club and Mushroom. Because of two different game modes, during Day mode Sun Blossom Wild Flower symbol appears and during Night mode A’s, K’s and Q’s symbols are replaced with the Joker Wild, Queen and King. Before investing real money players can try Ogre Empire Slot for free, or visit any BetSoft Casino such as: Crazy Fortune Casino, Wild Tornado Casino, SlotV Casino and others to play with real money and win. Before you start defending people of the town, wager needs to placed. “Choose Coin” will help you set up coin size, which ranges from 0.01 to 1. With “Bet Amount” you can set up number of coin you wish to bet. Gamble feature is activated with “Double Up”. To start the game with already highest bet amount use “Max Bet” button. “Autoplay” will spin reels automatically without any interruptions and click “Spin” to start the game. Day time mode activates when Sun symbol cover 1 whole reel. Besides triggering Day time mode, you will also win up to 4 of your stake, with the Sun symbol. Sun Blossom Wild Flower is a uniqe symbol that appears only during Day time. Symbol will grow near standart symbols turning them in to Wilds. Ogre Smash feature also happens during day time. Ogre will randomly smash reels, crushing stone symbols, then new symbols will land on the reels, awarding you with bigger wins. Night time mode activates when large Moon symbol cover whole reel. Moon symbol will award you with wins x6 of your stake. Joker Wild symbol will replace A’s symbol during Night time. Joker will land only on the 3 middle reels and it will act as a x2 Wild symbol. Night Blossom Wild Flower appears only during Night time mode. Night Flower symbol will turn 3 random symbols into Wilds.